One of our goals in homeschooling is to teach our children how to learn so that they will be life long learners. I think this is best accomplished by creating a literacy rich home! For me, this begins by talking to my children from birth, reading to my children, modeling reading, and providing a variety of reading and writing material. Point to the words while you read ~ your child will connect what you are saying to the words on the page and you will model left to right reading. Discuss what you are reading! Tie in the book with experience. It's easier to understand a story about a farm if you've been there. You can tie in barn, silo, and tractor to your personal experience and bring the story to life! In addition to books, you can enrich your home with print. You can can do this by reinforcing the print all around you, such as the print on a cereal box. Make a puzzle out of the front of the cereal box and put the puzzle in another cereal box for your child to put together. This reinforces the value of the print in your child's environment. Another idea is to label items in your home. Your child will connect that word to the item. A note about A-Bee-See's: Teaching letter sounds is more important than teaching the letter names. Point out letters to your preschooler in the books you read and tell them the sounds the letters make. Have fun with learning the letter sounds with activities that reinforce what they are learning. See our Alphabet Fun series to see what we did! 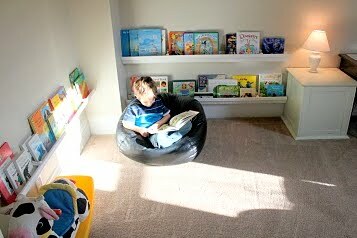 Do you have a special way to promote literacy in your home? Be sure to visit these brilliant women in this 10 days adventure between February 7th-18th! We love these ladies and we know you do too. I can honestly say that I excel in this area. :-) Yay!